We are ready as anyone to embrace the colors of fall. 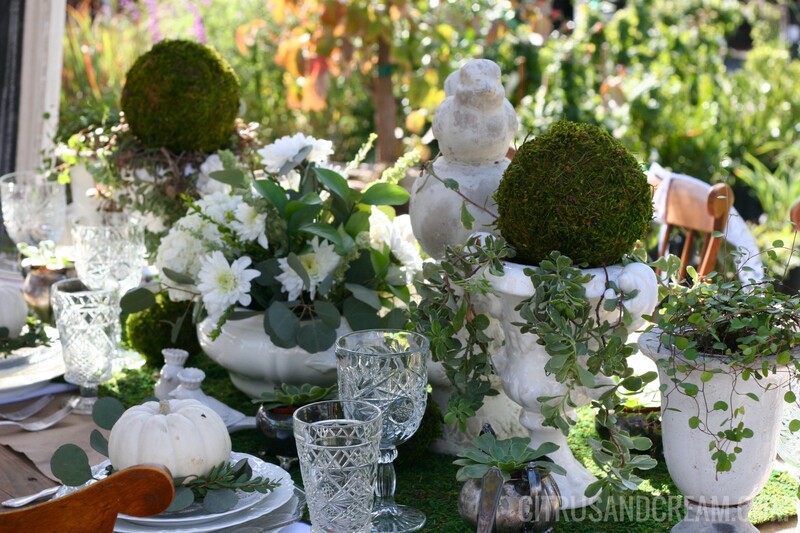 Deep reds, festive oranges, and shimmery golds always have our heart this time of year, so we were surprised with how much we loved the fresh green and white fall table at last weekend’s event at The Gardens. We weren’t the only ones smitten by it. We watched as people stopped in their tracks to take it all in. 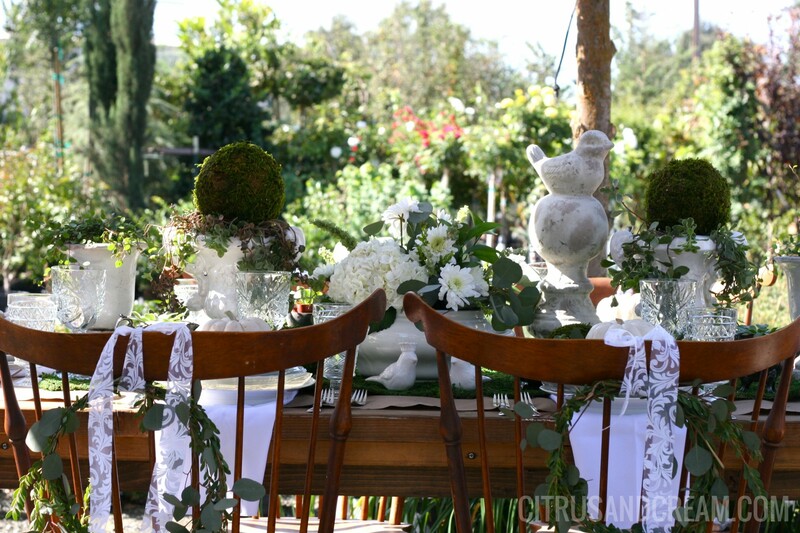 As soon as the event was over, we found the creator of the setting herself, Anna Rogers of Finders Keepers Wedding and Vintage Rentals, who shared her tips and tricks to create this beautiful table at home. Tip #1: Let yourself be inspired by something unexpected, such as the white Ironstone china featured in this table setting. I always start inspiration around something in particular: a color, a theme, a piece of furniture, an antique gadget, or in this case, my new-found fetish with dishware! I have recently started collecting Ironstone, a dishware that was first made in the United Kingdom in the early 1800’s. It is highly collectible among vintage decor collectors. My favorite pattern of Ironstone is the white porcelain. Make this work for you: Don’t have a collection of white Ironstone? That’s okay! Go for ceramic or porcelain white pieces, and look for interesting patterns and edges, like this white earthen-ware from Anthro that caught our eye. Mix in crystal and glass for more shine, and stack plates at each place to create more dimension and height. Tip #2: Consider the setting and backdrop, which in this case prompted a beautiful garden theme. The Gardens is a beautiful oasis in our drought-stricken valley. I knew right away that I wanted my table to display life and all things living, a fresh look so to speak! That is why I chose the colors green and white. 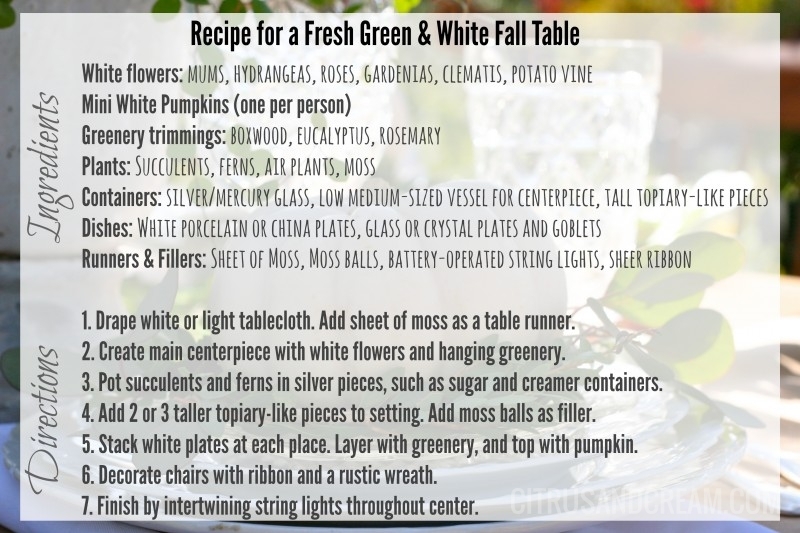 Make this work for you: Whether or not your setting is a garden oasis, you can still create a garden-inspired table setting for your guests to enjoy. Stick with this green and white palette, which works for a backyard party, a chic brunch, or a modern dinner. Tip #3: Incorporate live plant material, such as succulents, air plants, moss, and fern. 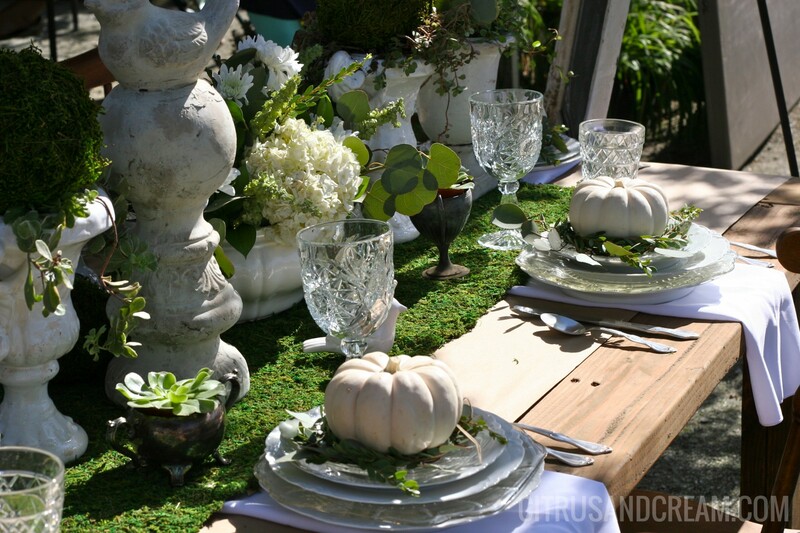 Succulents, moss, and other plants are all a very inexpensive way to dress a table. You could even go outside and look around your own yard and gather clippings from trees and bushes. 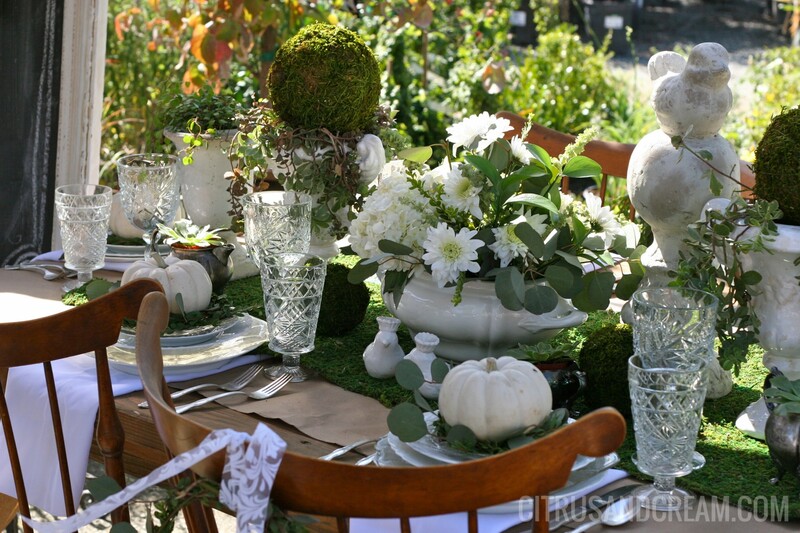 Make this work for you: Visit your local nurseries to dress your table. Focus on smaller plants with interesting foliage and textures. Rosette succulents, soft moss, and airy ferns are always beautiful, and air plants (tillandsia) add interest and a conversation starter! Plant these in whatever lovely containers or vessels you can find, and don’t be afraid to visit antique shops or Grandma’s kitchen. Tip #4: Consider sending your guests home with a gift straight from the table setting. I love the fall; however, here in the valley we often don’t have the opportunity to experience the change in colors. I came across white mini pumpkins and instantly fell in love with them! They fit perfectly on top of each plate setting and become a small gift for your guest to take home. Make this work for you: Find white mini pumpkins at your local nurseries or grocery stores this time of year. 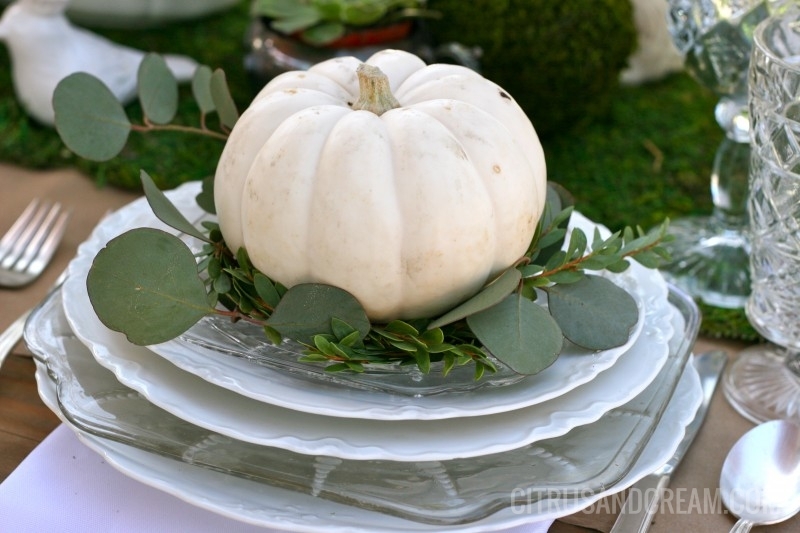 Make a layer of garden trimmings (eucalyptus and boxwood pictured here) and place the pumpkin on top. Have little bags or boxes ready to allow your guests to go home with the trimmings and pumpkin, which gives the start of their own centerpiece! Tip #5: Add dimension and layers to your table by incorporating different heights of pieces, and create a middle-height centerpiece to anchor the setting. You want your guests’ eyes to look up and down, somewhat like being on a roller coaster. It is more pleasing and entertaining to the eye this way. I created this effect by placing the succulents in some silver sugar and creamer containers. These beauties were considered the lowest point of height, along with moss balls placed in between. Middle height was centrally anchored by a fresh floral arrangement of mixed greens, white hydrangeas, and white mums, in an antique Ironstone soup tureen. The tallest point of height was accomplished by the taller urns with a draping plant. Make this work for you: Start by creating a wide middle-height centerpiece with all-white blooms and greenery. You can find a number of white flowers this time of year, like mums, hydrangeas, roses and gardenias. Make the lowest level with silver-hued or mercury glass containers (like this striking aluminum sugar and creamer set by Mariposa) containing smaller succulents or air plants. Create the highest level with slimmer topiary-like pieces topped with moss balls, and add draping greenery. Tip #6: Decorate your guest chairs. Don’t limit the decor to just to the table. Decor your guest chairs. For this I intertwined some leftover greens of boxwood and eucalyptus to form a wreath and then tied off with wire. I then hung on the backs of the chairs with white shear ribbon. Make this work for you: Create or purchase small, simple wreaths and add a sheer white or silver ribbon to drape the chair. Bonus Tips: Make a sheet or roll of moss, found at most craft stores, the table runner. Add a string of battery-operated lights (find them locally at The Gardens, E&R, or online here) down the middle of the table. Use vase filler items (like these moss balls) to add more to the table. Personalize each table setting by adding a place card (we love these mini chalkboards on easels). 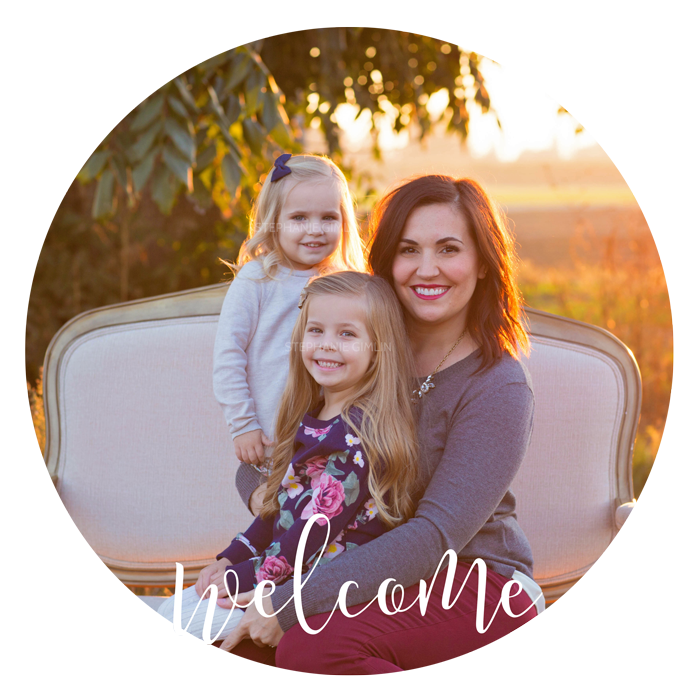 About Our Contributor: As a mother of four children, Anna began party-planning and decorating early with birthday parties, 4-H projects, and (later in her children’s lives) weddings. 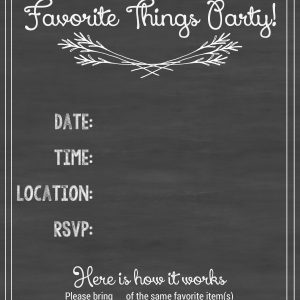 After much encouragement from family and friends, she opened Finders Keepers Wedding and Vintage Rentals. 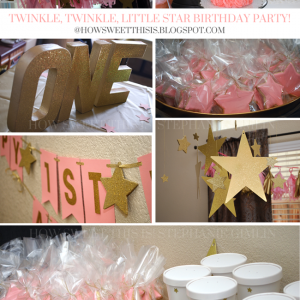 Her goal is to help others make their occasions memorable, while at the same time fulfilling her husband’s wish to do something with all the “stuff” she has collected over the years. You can find all of Finders Keepers’ beautiful rentals at The Gardens in Tulare, CA and on Facebook. We would love to hear your thoughts on this table! 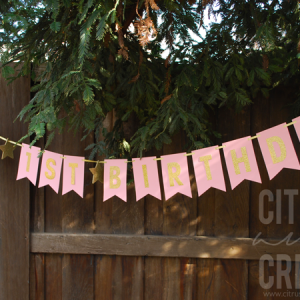 For us, we can’t wait to bring this home for an early autumn party. What about you? 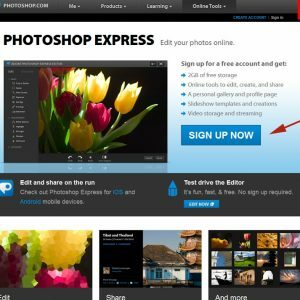 Note: There are some affiliate links in this post, which in no way impacts what we write or love. Wow! Thanks for sharing all the details of this table setting. I loved it when I saw it, but having it all spelled out is better than just the instant impact. 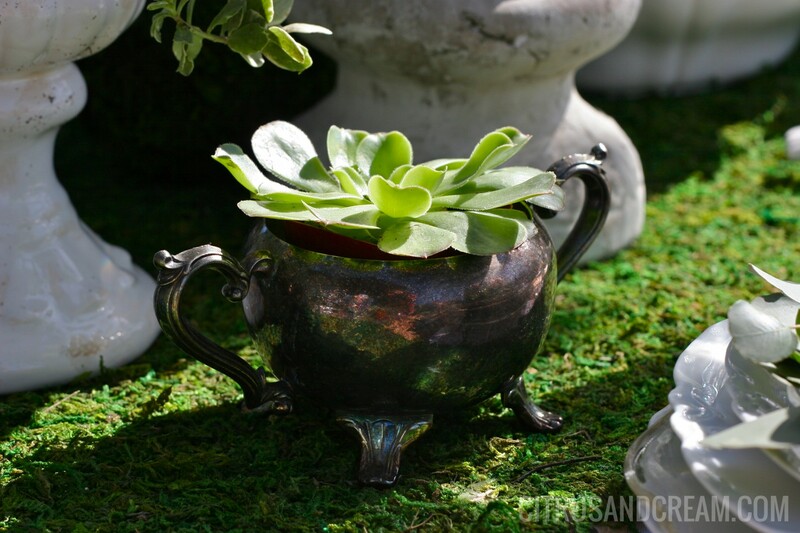 I loved the succulents in silver sugar bowls the best. Plus, you set up some great pics for me to Pin. I didn’t get such great shots myself. 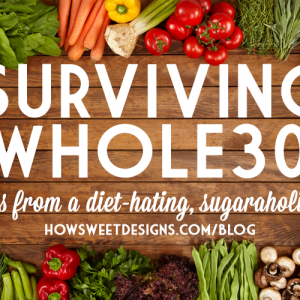 Thanks for the inspiration, Anna! Those white pumpkins steal the show! Aren’t they so gorgeous? I want twenty of them right now. Can you get them easily in SF, Chels?